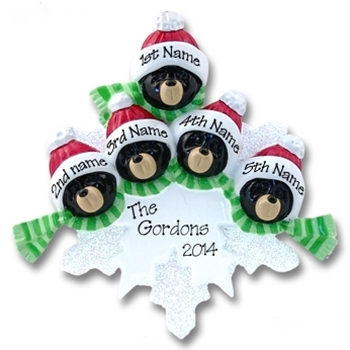 New from Deb & Co.'s "FAMILY COLLECTION" , this little SNOWFLAKE is loaded with black bears. Perfect for any family of 5, Grandparents or group. As with all of Deb's ornaments, it is wonderfully detailed. The snowflake has a touch of glitter for that special sparkle. It may be easily personalized with names and a year. Designed by Debi Allison, it is made from RESIN and hand painted. Comes complete with satin ribbon and hook for hanging. Available with 1, 2, 3, 4 or 5 bears.